Though singer Elijah Miller and guitarist John Kleber met at summer camp when they were 13 years old, it wasn’t until they stumbled across each other 12 years later that they discovered their shared passion for music. Along with drummer AJ Sausville, and bass, keys and violin players Stephanie Sanders & Joan Chew, they've created a powerful sound that references multiple genres and histories of rock, Americana, psychedelia and indie music, yet, at the same time, it proves to be something altogether contemporary and unique. 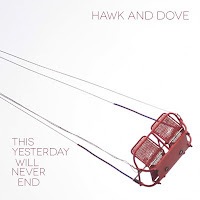 After honing their material regularly in some of NYC’s most distinguished venues, Hawk and Dove have recently finished This Yesterday Will Never End, which was recorded and mixed by Max Hodes, who also contributed backing vocals. Truly a journey at 13 songs and over an hour in length, this record invites the listener to explore the middle place where we all reside. Elijah’s lyrics curl around memories shared and imagined as John's angular guitar plays the shards of glass that simultaneously bind and repel us. All the while, the beautiful and surreal orchestral performances of Stephanie, Joan and AJ envelop the words with dynamic punches and strings of vibrant color. With both the impressive success of their 2009 EP, Rocking Chair, and powerful, moving live performances, Hawk and Dove's following has been steadily growing... something which should continue with the release of This Yesterday Will Never End and national tour they'll be embarking on in the Spring of 2013 in support of it.